From Hurricanes to Thunderstorms: Louisiana's Storms in Perspective. - MetStat, Inc.
From Hurricanes to Thunderstorms: Louisiana’s Storms in Perspective. Louisiana is no stranger to natural disasters. From droughts to flooding, since the year 2000 Louisiana has endured 8 natural disasters with over $200 million in estimated economic impact, and 22 FEMA major disaster declarations. To no surprise, the most famous, costliest, and deadliest natural disaster to hit Louisiana was 2005’s Hurricane Katrina. The most expensive hurricane to ever hit the United States, Katrina resulted in 1,833 deaths and economic impacts around $150 billion. At the time of landfall, Hurricane Katrina was a category 3 hurricane with sustained hurricane-force winds extending 120 miles out from its center. Aided by heavy wind and rain, the massive storm surge created by Katrina breached multiple levees and left large swaths of New Orleans underwater within moments of the initial breaches. With that in mind, it is understandable just how extensive the sheer amount of damage was. Given these impressive stats, it’s hard to imagine another non-hurricane natural disaster that could even come close to having such an impact within the state of Louisiana. Earlier this month, a much less exciting weather phenomena – in the form of a broad area of low pressure – settled in over the American Southeast. This allowed consistent thunderstorm development from August 11th to the 14th. This slow tide of steady rainfall dropped well over 20 inches of rain throughout Louisiana (compare this to the roughly 10″ totals from Katrina) and ultimately lead 13 deaths and has left tens of thousands homeless. In what has been called the worst disaster since Hurricane Sandy, the onslaught of thunderstorm rainfall created flooding virtually unheard of even within a state that by some measures is the wettest state in the country. Aftermath of Hurricane Katrina (left), compared with recent flooding near Baton Rouge (right). This organization of storms rotated around itself and continually dropped rainfall in both the Baton Rouge and Lafayette areas. Below is a plot generated by MetStorm showing the total rainfall over the 96-hour lifespan of the MCS. A mass curve plot was also generated by MetStorm, for the area that received the highest total rainfall within the analysis time. Note that for multiple hours across the first two days of the storm event rainfall values exceeded 1″ per hour, and that even after the largest storms had passed, the area still received steady rain for almost another 48 hours. Of course, flooding is not only apparent in precipitation data, but in river gauges as well. 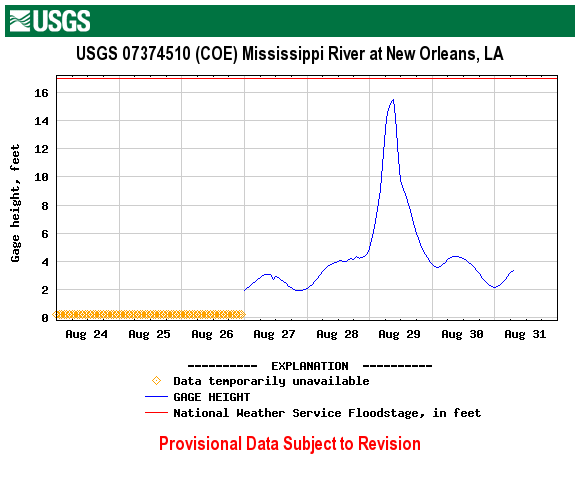 The first plot below shows river height in feet of the Mississippi River near Baton Rouge. Over the course of about 24 hours, the Mississippi rose roughly five feet. For comparison, levee breaches and heavy rain during Katrina rose the Mississippi river at New Orleans by nearly 16 feet in less than 12 hours. Smaller rivers, like the Comite River also plotted below, were subject to the largest increases in river height. In the same 24 hour span in which the Mississippi increased, the Comite River rose from just a foot or two to over 25 feet, shattering the previous gauge height record set in 1961 by over a foot. The large increase in river heights also correspond to the hours with the largest amounts of precipitation, seen in the mass curve plot above. Finally, in assessing the rareness of this flooding event, we calculated the average recurrence interval of the maximum amount of rainfall at each grid point for both 1- and 24-hours. Diagnosing the maximum ARI value over a 1-hour time span reveals a maximum grid cell value of 94.81 years (i.e. the one hour rainfall maximum has a ~1 in 95 chance of occurring in a given year). While rare, this value is not exceptional in terms of causing such an extreme flooding event in Lousiana. However, paired with the 24-hour ARI analysis, you’ll notice the number of areas that had 24-hour rainfall totals so high that they would only be expected less than once every 1000 years. A single thunderstorm (usually producing rainfall in a fixed location for less than an hour) did not make this event what it was, but rather the large MCS that organized thunderstorms to produce lasting, steady rainfall for days on end in the same locations in the state of Louisiana. The aftermath of the Louisiana floods have given pause to many residents in the state, and determining how to rebuild after another major flood will be a difficult challenge. In the weeks to come, there will likely be a lot of tropical storm activity in the Atlantic, and we hope that Lousiana is spared from any major tropical storm that finds its way into the Gulf Coast. Please note that the maps presented here are preliminary and will be updated when new data become available. If you are interested in this product, or any other product from our MetStorm® Precipitation Analysis tool, please contact us at media@metstat.com or through our contacts page at here.